Along with a collective of local officials and citizens, two members of Summit County's Water Rescue Team used a piece of heavy excavation equipment and a cable to tie together a group of tangled spruces on the upper Blue River in Breckenridge on Monday morning, June 13. The conern was if the massive evergreen pile released, it had the potential of taking out several private bridges heading toward the river crossing at Swan Mountain Road. Sometimes it takes a village to raise a tree. This past week Thursday, June 9, the caretaker of a property near the Church at Agape Outpost in Breckenridge, between Tiger Road and the river crossing at Swan Mountain Road, spotted a large spruce beginning to fall into the upper section of the Blue River due to erosion. By Sunday morning, a resident further north noticed the immense timber — estimates put it at between 40- and 60-feet tall — had been collected by the waterway and traveled a few hundred feet, under a small footbridge, and now sat in the middle of the river after hooking onto a rock. A couple phone calls later, county officials were mobilizing at the site by the afternoon. The group, including the sheriff’s office and its water rescue team, had to figure out how to pull the evergreen from the Blue to prevent it from taking out several bridges that serve the private homes on the east side of the river. From that point, there were worries the tree might knock out each successive bridge, creating more debris to clog the river passage and create a makeshift barricade at Swan Mountain. Once the water backed up there, it might run over the top of the road and cause some much larger complications. Members from across county government — the Road & Bridge and Open Space & Trails departments and the Manager’s Office — with assistance from private construction businesses Stan Miller, Inc., and Breckenridge Crane Service and the private landowners, hatched a plan, and the parties met back up early Monday morning. 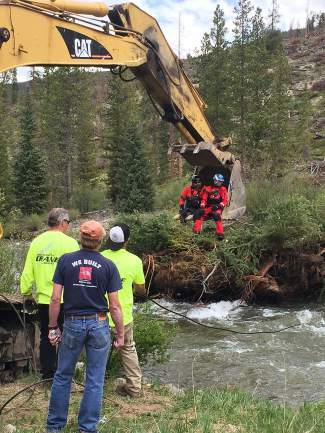 Stan Miller owner, Kurt Miller, offered a track hoe from his excavation company, Breck Crane provided cable to tie up what was actually three spruces tangled together by a single root ball and the Water Rescue Team hopped in the heavy equipment’s scoop to get to work. Over the course of about an hour and a half, the pair of rescue officers knotted the trees to each other with the cable, and Miller clawed at the root ball to draw the coiled spool of branches to the riverbank. After it was secured, the trees were split up and taken to higher ground near the roadway, so it could all be cut up and prepared for hauling and eventual chipping into mulch for composting at the county’s landfill in Dillon.